Evian – both the water and the town - suffer from nothing. It is one of the most widely recognized bottled waters on the planet and it’s a ridiculously beautiful place in France. But people still ask me about Evian's water source. "It comes from a natural spring in the town of Evian," I tell them. "No seriously, where do they get the water,” they ask. People seem to think that Evian water does not come from Evian but from…well, where exactly? So in October 2018 I was in Evian France and I went to the exact source of the water so I can explain it firsthand. Set amid dairy farms, grasslands, strands of trees and crops is a 35 square kilometer (8,600 acre) piece of land, in essence a catchment basin, or more appropriately, a flat mesa called Plateau de Gavot. In reality it's a large table of land and it sits above the town of Evian. If you ever visit Evian via boat from Lausanne Switzerland this shelf is clearly visible from far away, which then drops off and curves down to the lake where the town and actual spring are both located. If you drive into town you don't notice it. It's on this land that the rains beat down and the water is absorbed into the dirt – glacial sand, clay, and gravel - seeping down between 100-200 meters (300-600 feet) then slowly makes its way under the hillside, taking about 15 years before it percolates to the surface at several natural springs, one of which you can actually visit. Standing atop the plateau on a bright, crisp October day, there is little that is remarkable about being here except for its own natural beauty. Sure, the dairy cows meander about (producing a well-known cheese known as Abondance – meaning “abundance,” which also alludes to the amount of water inside these hills), the bells around their necks jingling like an archaic GPS while hawks pierce the air overhead. There are rugged mountains in the distance – actually the inspiration for the mountains that appear on their label - but this particular place, well, it has nothing of significance that the eye can see. But like most water sources I have visited across the globe (Europe, China, U.S.), the real story about water is almost always what you don't see - what happens under our feet. Rain water travels about 10 miles through the plateau to the springs then the remaining water runs into Lake Geneva, picking up minerals and trace elements like calcium and manganese from the moraine soil and glacial sand. That water is bottled and labeled, “Evian,” because it comes from there, a unique spring that was “discovered” in 1789, though like natural springs across the globe they have been around for thousands of years until someone stumbled upon them and realized they could make money. Just outside of the town of Evian is their bottled water plant (photos are not allowed inside), which, if the buildings were laid end to end, would run the length of 13 football fields. Shipping your water to 140 countries and offering 30 different SKUs means you need a lot of space. It also means you're bottling constantly and the Evian bottled water plant runs all day, every day. The only time the machinery isn't running is for eight hours Saturday to Sunday when the bottling lines are being cleaned. The plant is like most bottled water plants, rather uninteresting in terms of blow molds and cases of product moving about on conveyor belts. Frankly, every bottled water plant I have visited are sterile and uninspiring. What I did find interesting to watch were their 30 AGVs - automatic guided vehicles - doing the work that fork lift drivers used to do. AGVs are like driverless cars but in this situation they pick up cases of water from the bottling line and deliver it to palates for shipping, pausing and waiting for other AGVs to pass at “intersections” where multiple vehicles meet at the same time. Though devoid of human interaction, there is nonetheless a delicate and rather beautiful ballet of technology happening on the ground. You can visit the Evian plant - there's a small gift shop and museum showing what Evian bottles were like back in the day when the resort was initially a tourist destination where people “took the waters.” Aside from that you can also visit the spring, the place where Evian water actually does come from. A visit reaffirms that the best bottled waters come from a specific source, offering the taste of a unique fingerprint of soil, rain, rock and time. 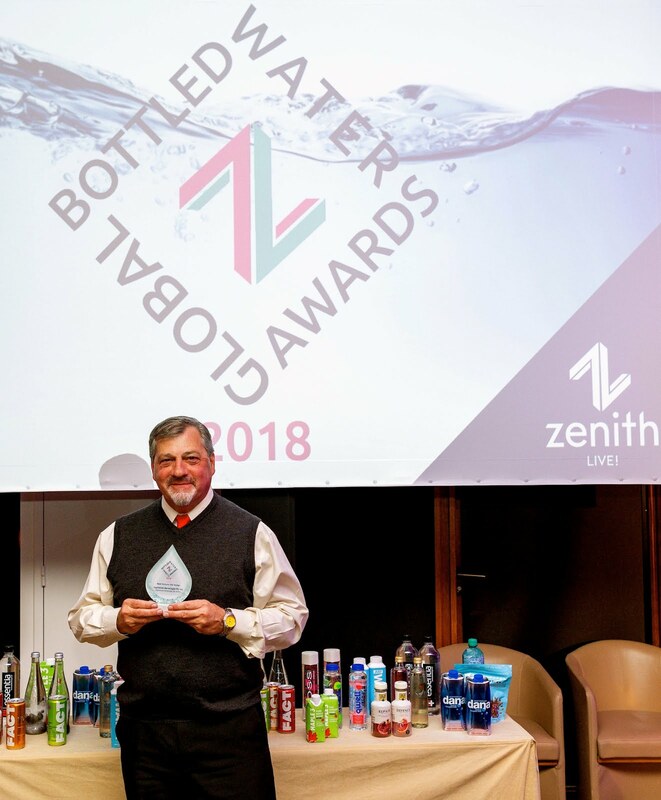 I have been fortunate to be invited to be a judge for the last several years at the Global Bottled Water Congress and Awards, organized by Zenith Global. 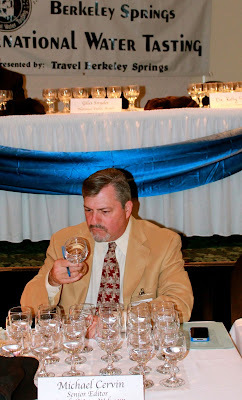 As a judge at the Berkeley Springs International Water Tasting for the last decade I know that judging water is a remarkable, if not nuanced, experience. But Zenith makes their water competition unique. 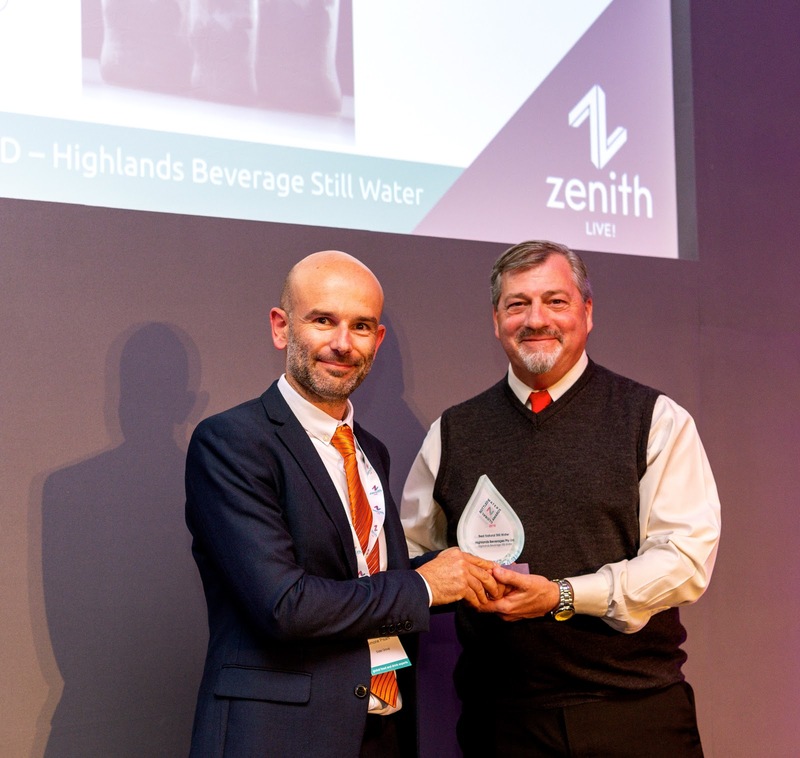 In addition to the awards for best still water, sparkling, flavored and functional waters, there are awards for innovation, sustainability initiatives, and even marketing campaigns. --2017 saw 420 billion liters of bottled water in volume sold worth a staggering $194 billion globally. --Zenith projects that bottled water, including flavored and functional water, will outpace all other beverages in 2018/2019. --Asia still dominates the bottled water market, as China remains the leader in terms of volume. 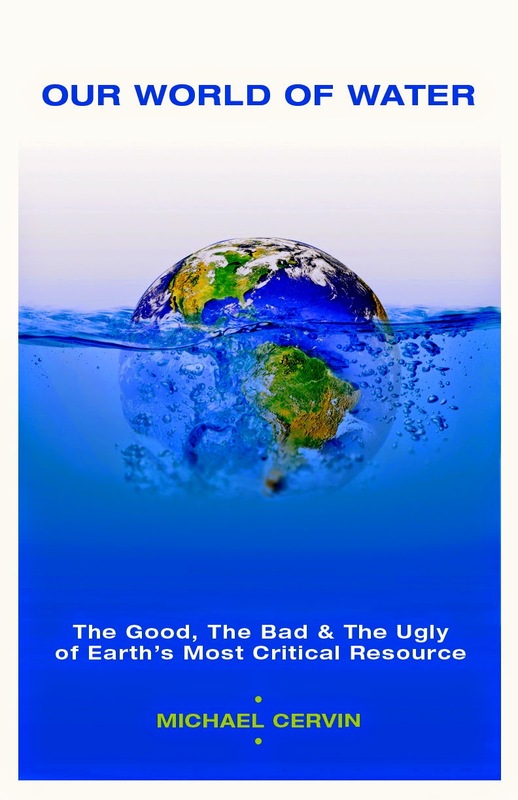 --520 million liters of alkaline water are sold worldwide. It's still considered a niche product but the category is nonetheless growing. --According to Zenith the average person across the globe drinks 62 liters of water each year. 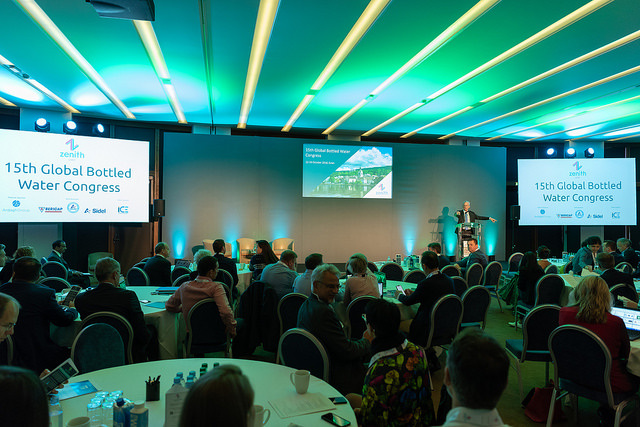 This year there was a greater focus than in previous years on sustainability during the Congress, which saw speakers from across the globe. “We have to act where we always believed the government should act,” said Zenith Chairman Richard Hall regarding enforcement, transparency and sustainability issues facing the industry, during his opening remarks. And yes, the bottled water industry cannot and should not wait for any government to map out what is appropriate for a specific industry. That the bottled water industry has in some ways ignored these issues is no longer acceptable. It's time for the bottled water industry to be a true leader, to make sustainability a top priority but also get their message out that indeed there are innovations and programs to support the environment happening all the time, but the industry, quite frankly, does a terrible job of talking about them. Another subject presented by Tetra Pak's Environmental Director Erik Lindroth discussed a data study they had done within Scandinavia countries whereby over time, given personal responsibility of our own choices regarding the packaging problem, their study showed that a polarization had developed between those who feel adamant that recycling is each individual's duty, and the opposite with those who feel increasingly skeptical that recycling and its logical link to climate change is really even a viable issue at all. Yet numbers don't lie and whereas recycling rates need dramatic improvement, the largest contributor of ocean plastic is Southeast Asia, accounting for 80% of ocean plastic waste. And clearly this is a land-based problem given that many Asian countries do not have adequate capture rates including curbside recycling, not to mention any viable infrastructure to even support it. The subject of bio-based bottles was brought up as a potential problem solver but as Andy Peykoff of US Niagara Bottling suggested, “a bio-based bottle will not solve plastics in the ocean.” There needs to be the will to act responsibly coupled with greater education and awareness and to insure that the industry itself is operating on a sustainable model. And this is still where the bottled water industry consistently fails overall. Plastics is the single major stumbling block and the current information about ocean pollution from plastics – all plastics, not merely water bottles – will not go away any time soon. “The bottled water industry is really a plastics industry,” Marc Bettinger, Market Development Director for Ardagh Group told me during a session break. Ardagh presented a new line of aluminum cans which, though beautiful and boasting innovative designs, still suffers from being merely a can. Yet water packaged in cans, even glass, is certainly a viable offering over plastic. These are some of the issues still to be dealt with as the bottled water industry begins to dominate the marketplace. 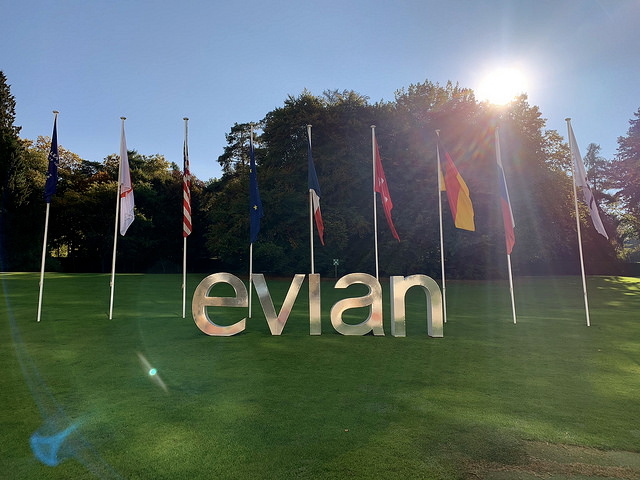 There was also a visit to the catchment basin and bottling plant of Evian, there were new innovative waters presented and a great sense of camaraderie amongst delegates. If you’ve ever wondered about attending, I highly recommend it. A complete list of winners is below. Flint. In that singular word is summed up a water crisis. Even if you don’t know much about what happened, the word Flint is now associated with water, and not in a good way. Flint, Michigan is where this book takes place. The city of Flint always relied on public drinking water from Lake Huron. 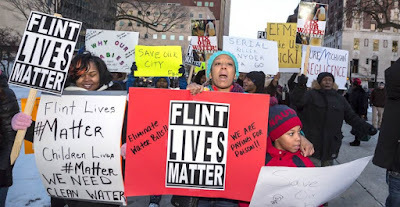 But that water was more expensive and Flint’s economic woes caused a chain reaction that caused the city to switch to another public water source; a chain reaction that many public officials still have not been held accountable for. 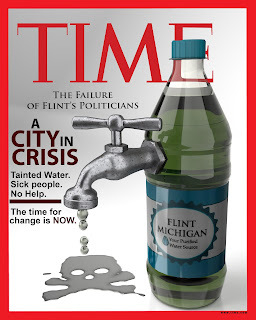 April 25 2014 was the date the water supply changed from Lake Huron to the Flint River, a switch precipitated by the basest of all things…money. It was cheaper to use degraded water. But the public noticed immediately. The water looked bad and tasted worse. More chlorine was added; boil alerts were sent out. It was suggested by the city that residents should “flush” their water for at least five minutes before using it. As author Mona Hanna-Attisha points out, it was discovered there were lead contamination issues with Flint city water. But the book also addresses the larger issue of lead that it is a subject rooted in the historical context of the seen physical environment. The author states: “When the League of Nations banned lead paint in 1922 the U.S. declined to go along,” she writes. “At that point the regulation of lead paint in this country was almost nonexistent. Lead was big business in America.” And everyone thought of lead as a physical property that was tangible - paint. In fact lead was finally restricted, but not totally outlawed, in plumbing – those pipes in our home bringing us clean water - only in 1986. Once the lead issue was exposed to the media and to the whole of the American public, the bottled water community stepped in providing innumerable cases of clean, fresh water for residents. Beginning in 2016 the state had been providing free bottled water for residents, but that came to an abrupt halt in April 2018. As the New York Times reported, the City of Flint is currently working with contractors to replace all of the affected lead compromised plumbing lines by 2020. “Just over 6,200 have been replaced so far,” said Steve Branch, the acting city administrator. “An estimated 12,000 could remain.” This mean that there is still compromised plumbing. But perhaps one of the most disturbing things about the water crisis is found on page 284. 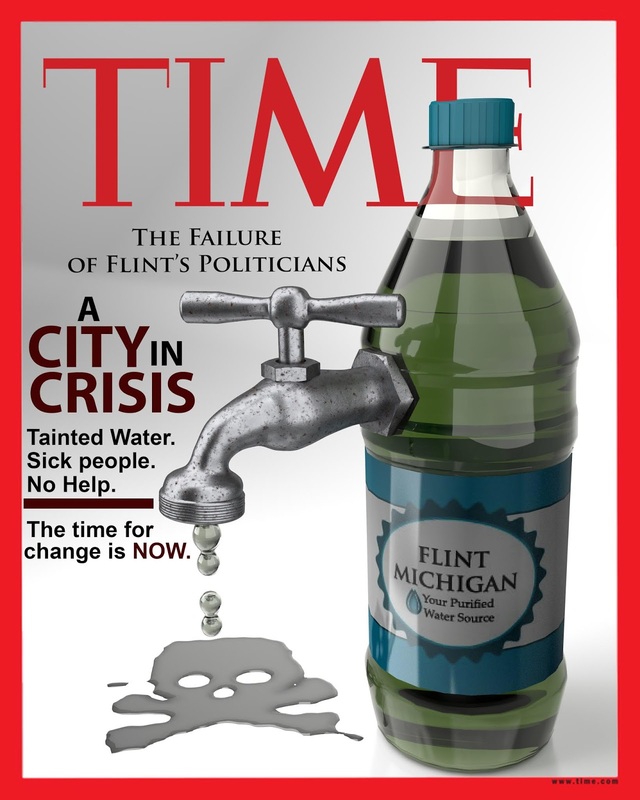 “We found out later that in January 2015 state officials, while telling Flint residents that their water was safe to drink, were arranging for water coolers to be delivered to the Flint State office building so state employees wouldn't have to drink from the tap.” This revelation shows the staggering callousness of local officials. Fortunately, due to her commitment, the author was able to unravel the lead contamination and bring the issue to light. 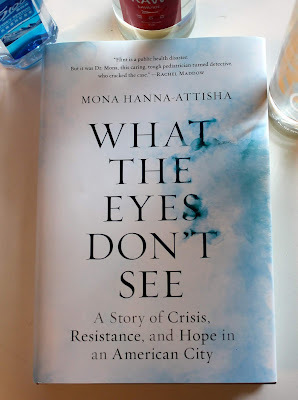 While the book is an interesting read in terms of how the water crisis unfolded, it also is a message of troubling proportion in terms of local, county, state and federal officials and their willful deception in ignoring the lead crisis. What the Eyes Don’t See serves as a reminder that we must continually fight for clean water, an issue that desperately needs to be addressed not only in Flint Michigan, but also across the US and across the globe where water is being compromised on a daily basis, sometimes out of ignorance, but almost always because of money. And do not be fooled. This could happen where you live too. As a water writer I get great opportunities to promote the idea that water is not just water, but that naturally occurring waters are all unique. A magazine called The Clever Root asked me to name the "10 Best" waters like this for their summer 2018 issue. Now whereas I'm not fond of a "best" list, at least it gets people talking, thinking and hopefully seeking out these waters. Enjoy! handing out gold, silver and bronze awards to water; specifically municipal and bottled waters. As a judge at this competition for many years I have witnessed first hand the impartiality of the judges. Of the dozen judges brought in annually, the majority are new to the game in a given year, meaning they are not attuned to the nuances of water on a daily basis. What’s remarkable about that point is that the 2018 awards was chalk full of former winners. The municipal water category was a battle of former winners with the water judged best in the world for 2018 - Clearbrook, British Columbia, Canada – also the biggest medal winner in the event’s history. The best water in the USA came from Santa Ana, CA, another former gold medalist. “The consistency in winners from year to year with different panels of judges validates the choices,” said watermaster, Arthur von Wiesenberger. “It also speaks to the impressively high caliber of the waters entered.” Simply put, great tasting water tastes great and people are able to discern that. The competition, open to the public, saw nearly 100 waters entered from a cross the globe from places like Turkey, Cyprus, Jamaica, Trinidad-Tabago, South Korea, Bosnia, Greece and Australia. Waters were tasted in four separate flights over two days. Held in the small enclave of Berkeley Springs, West Virginia, the awards have garnered national press and many winners not only use the Berkeley Springs seal on their product, but also see a bump in sales after winning. I hear it all the time. Water is boring so I don’t drink it - I’m too busy - I forgot. Whatever the reasons, many people don’t drink enough water. The bottled water industry has responded with flavored water, carbonated water, functional water, playful bottles and labels, the shape and feel of a bottle, anything and everything to make one of the essentials in our lives – water – easier to consume and therefore to keep us properly hydrated. As a judge for the 2017 Global Bottled Water Awards, presented by Zenith Global Ltd., in addition to judging categories like Best Tasting Water there is the Best Cap Closure category and I was sent a new device, which I’m impressed by, called the smart cap. Trago, for example, uses an integrated stainless steel bottle with a smart cap that accurately measures how much water you drink. It connects to your smart phone and other wearable devices and allows you to measure your hydration levels. Gatorade also has a similar system. But these are complete systems whereby the bottle and cap are fully integrated and essential to each other. Water.IO has taken this technology further by creating just a bottle cap that fits most water bottles, replacing the cap already on it, transforming most any water bottle into a smart water bottle. This technology is a disposable cap that contains a simple reminder that blinks, vibrates, or sounds an alarm to alert users that it is time to drink water. The smart cap keeps track of when the water bottle is opened or closed and settings can be changed to alert users to drink during a predetermined period – such as once an hour, or once every half hour, and the technology will adjust reminders based on bottle usage so users aren’t reminded to do something they’ve already done. The caps come in various shapes, colors and materials, and lights can come with various colors and sequences, plus there is the ability to add vibration to the reminder as well. They also manufacture a “clip on” version, a cap that attaches to an existing bottled water cap. Using the Water.IO app connects you to all the major health mobile platforms - Google Fit, Apple Health kit and Microsoft Health, as well as popular fitness devices and applications such as Fitbit and Jawbone. Certainly not everyone wants a reminder to drink water every hour, but beyond the casual user, this technology is ideal for the elderly who may forget to keep hydrated, kids who tend to forget or haven’t developed good hydration habits yet, and for those with medical conditions where keeping hydrated is essential and, frankly, life saving. Water improves our lives every day, and frankly technology should do the same. With smart cap technology, two worlds come together to make our lives better and easier. Water is critical for the survival of every person. But how people think about and consume water does vary - local habits and knowledge affect water consumption in specific ways. Kantar TNS, a global market research company, and Nestle Waters published a survey on attitudes about water consumption looking specifically at seven countries: China, France, Italy, Mexico, the UK, the US and Turkey. What are the main differences in water consumption and drinking habits among countries? What are the main reasons people cite for drinking or not drinking water? How is information about water and hydration habits perceived? 3,504 people were surveyed, about 500 people per country. Each sample was representative of a population aged 18 to 64 years (except for Mexico and Turkey, where the survey included anyone over 18 - and in China, where the surveyed population was aged 18 to 55 years old). Not surprisingly all respondents in every country defined drinking water as a daily habit. Nine out of 10 participants say they drink water every day - mostly bottled water (59%) and tap water (44%) but also filtered water and water from drinking fountains (23% and 20%, respectively). The UK emerged is the smallest daily consumer of bottled water (39%) with Italy being the highest (81%). China stands out in the consumption of water from drinking fountains (48%), with a 20% average across all countries. When respondents were asked which beverage they drink every day, the most popular beverage after water is milk for China and Mexico, and hot drinks for the other countries. Nevertheless, the consumption of water is much higher than for any other beverage: 68% of people drink at least 1 liter of water (of any kind) per day. Regarding the other types of drinks consumed daily, 4 out of 10 participants drink at least 1 glass of soda per day on average, and sodas are consumed daily by 5 to 6 participants out of 10 in Turkey and Mexico. Sports and energy drinks are consumed daily by 1 out of 5 participants in Mexico, Turkey and China. However 96% of people reported consuming water all day long. On average, 1 respondent in 4 often drinks water while driving, though the average rises to more than 1 in 3 in the US. Drinking water, tap or bottled, is foremost a question of need for 93% of the respondents but the belief about the number of glasses needed per day differ between countries. Nevertheless, there seems to be a link in the mind of the respondents between the amount of water they think they should drink, and the amount of water they consumed. 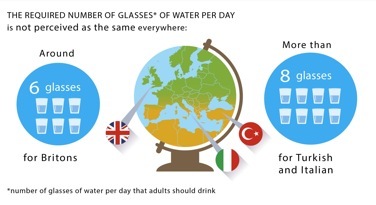 --8.9 glasses daily was the amount an adult needs every day according to Turkey. -8.5 glasses a day for Italy. -6.1 glasses of water are needed per day for those in the UK. Bottled water is consumed for health and safety reasons (93%), and because it is perceived to be “natural” (91% believed this); convenience is the main reason highlighted by tap water drinkers (88%). Survey respondents felt that drinking water equates to a healthy lifestyle and maintenance for one’s health (94% for both). The respondents believe in water’s benefits to internal body functions: on average, the two main benefits put forward are the actions of water to flush out toxins, and to aid digestion. 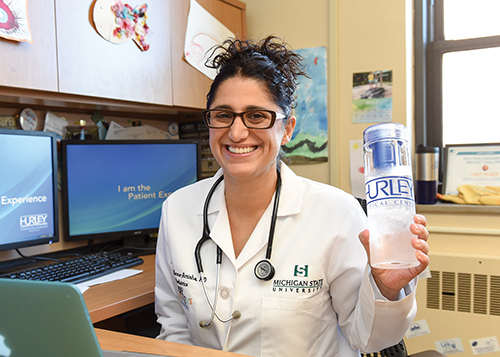 On average, almost 1 out of 4 participants thought that drinking water was the same as drinking other beverages such as hot drinks, soda or fruit juice. The most credible advocates for water? Healthcare professionals 90% said, and scientists 88% responded positively. Family also plays a crucial role in promoting water consumption, especially in Mexico, Turkey, China and Italy. Prevention campaigns and schools are also considered credible (both with 77%). Clearly there is misinformation about how exactly water improves your life and body functions, both with bottled water and tap water. Personally I drink two liters daily and know that the effects of water are long term and healthy. GET MY BOOK! (Click the cover). "OUR WORLD OF WATER" - The book! Enter the 2018 Global Bottled Awards! I am a writer, author and speaker with an emphasis on Food, Wine, Travel and Water. I am the Geneva Correspondent for Forbes, the Senior Editor at BottledWaterWeb, the Restaurant reviewer for Gayot.com (Santa Barbara and Ventura counties), author of 6 books and contribute to magazines globally. Copyright 2012, Text & Photos by Michael Cervin. Picture Window theme. Powered by Blogger.